Senior Rachel Pang and freshman Jesh Gandhi pose with their awards after winning first in public forum debate at the Eastern Missouri NSDA Districts Tournament on March 10. 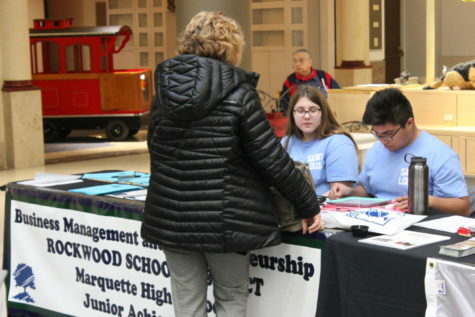 This year five MHS students qualified for Nationals, which will be held in Dallas during June 16-21. The audience anxiously waited to hear the results of the tournament. 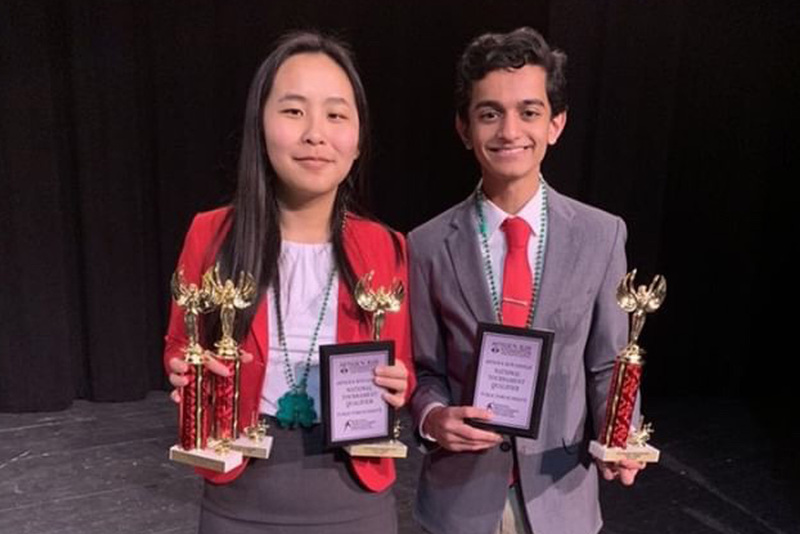 After suffering the suspense to hear the announcement of first place, freshman Jesh Gandhi and senior Rachel Pang were excited to learn they would be going to Nationals for speech and debate. 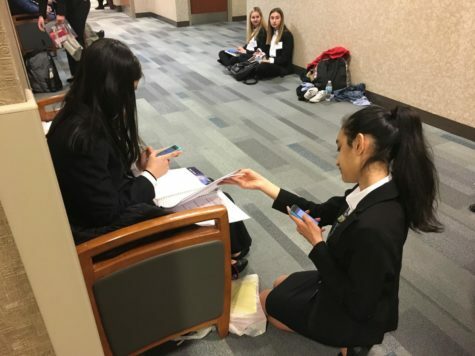 “Having the opportunity to go to Nationals is incredible especially since there weren’t any other freshmen who qualified so it was a very surreal experience,” Gandhi said. 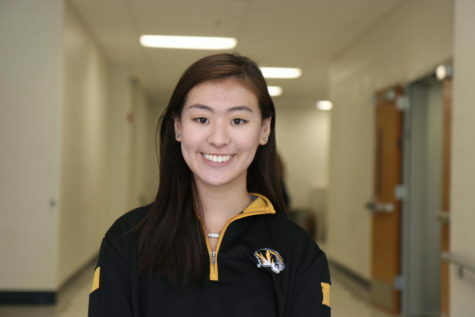 Gandhi and Pang are two of five students from the speech and debate team qualified for Nationals, the largest number in the team’s history. 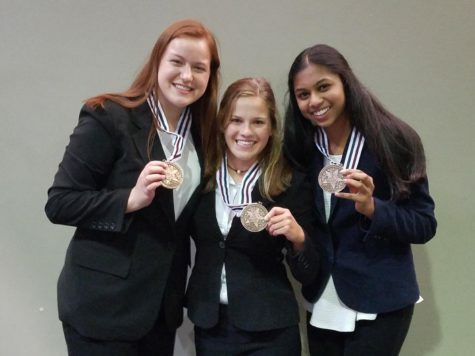 The other three are Madison Lakamp, senior;, Megha Sanjay, sophomore; and Sarah George sophomore . Gandhi originally competed in Lincoln Douglas debate, but quickly adapted to public forum debate because Pang needed a partner. It was for this debate that both qualified. For a week before the tournament, Gandhi worked with his Pang on a daily basis to learn the case and prepare. Gandhi said it was difficult to adjust because Lincoln Douglas was based more on morality while public forum is evidence based. However, he said the experience of debate with a partner has led him to switch to public forum for next year. Gandhi said one of his strengths was speaking, which he developed through theater. However, he said he struggled with using evidence because he was used to using hypothetical situations in Lincoln Douglas. “Gearing toward evidence was more difficult because it almost seems you had to know and memorize each fact that was on all the cards,” Gandhi said. Ray Holmes, assistant speech and debate coach, has been involved with the team after being invited to judge some tournaments. He said his job is mainly supportive by giving students feedback and helping them during their successes and losses. Holmes said each year the team works to improve the process of enrolling for tournaments and to finetune the procedures used for new students. 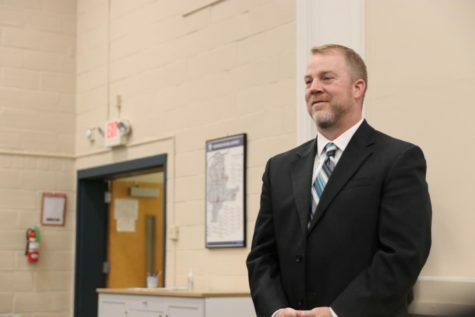 “The students this year were more methodical in the way they taught the new novice students about each type of debate or speech event,” Holmes said. For his efforts assisting the team, Holmes received the NSDA Eastern Missouri District Assistant Coach of the Year award. 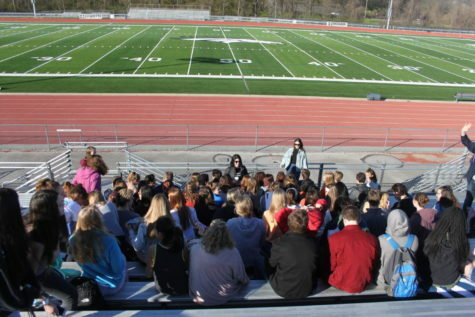 The recipients are chosen from nominations by other speech and debate coaches. 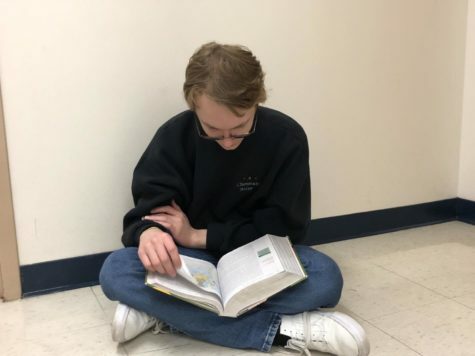 Pang, who is president of the speech and debate team, said Holmes deserved the award for his calming presence and dedication to the team. “He’s always the first to volunteer to use his room at 7 a.m. in the morning on weekdays pretty much anytime we ask him,” Pang said. Pang qualified for three different events: public forum debate, congress and international extemporaneous speaking. However, she is only allowed to compete in one event at Nationals. 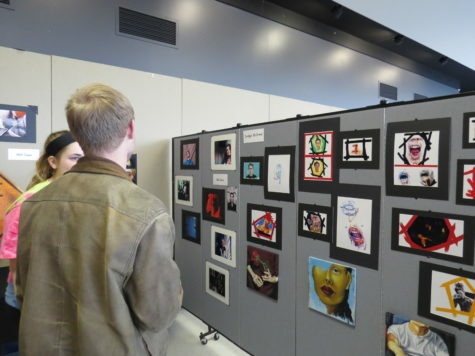 She said that before the tournament, each student filled out a single entry of event intent, which is used to rank events that students want to compete in the most. Despite this rule, Pang will still be able to compete in public forum since it was her partner’s first choice. Pang has done all of her events since freshman year, while many people start their event later. Pang said her freshman and senior years were memorable seasons.